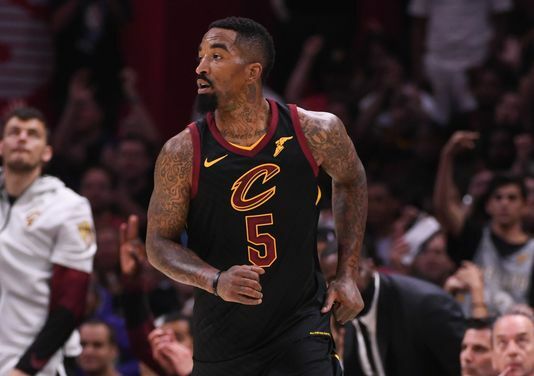 It looks nearly certain that J. R. Smith's stint with the Cleveland Cavaliers is about to end. The Cavs are dead last in the East with a 2-13 record. Smith's role with the team is limited, and he wants out. It seems Cleveland will oblige. Suitors won't exactly be lining up for the 33-year-old shooting guard. He can be a loose cannon, but he may have value for a playoff-bound team looking for a final piece. J. R. is averaging 20 minutes per game for the Cavaliers, and he is averaging only 6.7 points/game on 34% shooting. Not exactly a fine resume for a guy about to be out of work. Smith is not the 14-year veteran that Celtic Kyrie Irving suggested his team may need. And Marcus Smart would second that thought. We remember the Smart/Smith scuffle that almost, but never, happened. Still, a trade is possible. Lebron James may want his former teammate back, this time on the Lakers - but only if J. R. can keep track of the score and time clock. Another option would be a buyout of Smith's contract. Then he could go anywhere where he would be welcomed. This could get interesting.